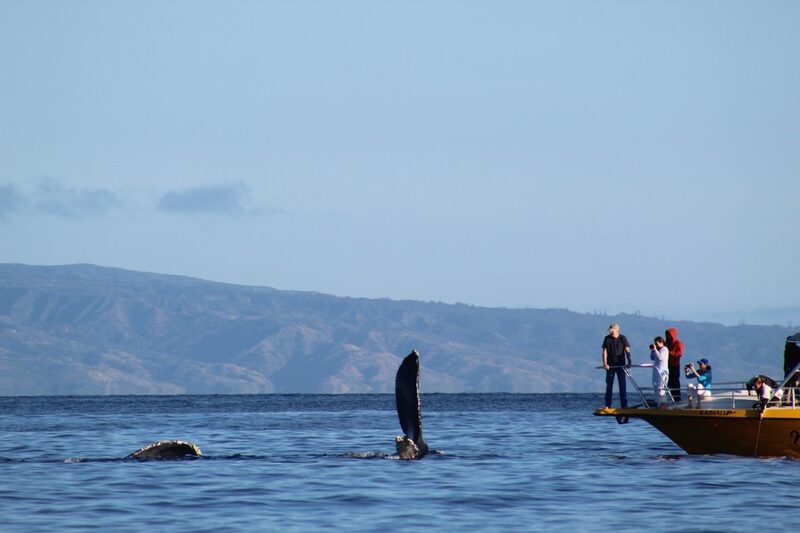 Whale watching tours on Maui are made great by knowing important whale migration facts. Facts like migration dates, behaviors and most importantly the best place to see whales in Maui. Where’s the Best Place to See Whales? The best place to see whales in Maui is the Maui Nui Basin. It’s estimated that more than half of the humpback whale population migrates to the Maui Nui Basin for breeding every winter. The Maui Nui Basin refers to the waters between Maui, Lanai and Kaho’olawe and is a protected sanctuary for the whales. These waters are directly in front of Lahaina and Kaanapali, Maui, which means whale watching from Lahaina Harbor is the best place to whale watch. Pack binoculars because you can often see whales breaching from shore along the south and west coast of Maui, but for closer-encounters, booking a whale watching tours on boats is the way to go (You can book a tour with us here). There are a variety of boating options- large sailor catamaran style vessels with larger groups of guests or small group charters which is what we offer at Ultimate Whale Watch. Our small group tours mean every seat is a front row seat on our whale watching vessels and our boats are quick, getting to the whales faster so we can spend more time observing these amazing marine mammals. How Do You Get to The Best Spot? Departing from Lahaina Harbor, Maui, Ultimate Whale Watch takes guests right into the waters of the Maui Nui Basin, observing humpback whales exhibiting a variety of behavior reflecting courting, breeding, teaching, learning, and playing. Lahaina, Maui is also on the leeward side of the West Maui mountains which often provides shelter from wind and rain, creating an ideal weather environment for boating and whale watching in Maui. If you are staying in Kihei, Maui or Wailea, Maui, make a day of it and drive to Lahaina, Maui for a whale watching tour, have lunch and explore and shop in Historic Lahaina town. Maui whale watching tours start at sunrise and end at sunset so you can plan your tour around your schedule. Don’t miss an encounter with these the amazing humpback whales migration to Maui! Reserve your seat at our next whale watching tours.